As the world continues to face the largest displacement crisis since World War II, President Trump’s first year in office has been marked by xenophobic, anti-immigrant rhetoric and increasingly punitive policies that effectively criminalize the act of seeking asylum. The Trump Administration is expanding prosecutions for unauthorized border crossing by targeting refugees legally seeking the protection of the United States. In so doing, it is violating both U.S. and international law. On January 25, 2017, President Trump issued an executive order calling on the Department of Justice (DOJ) to make criminal prosecution of immigration offenses a “high priority”—even though such cases already made up more than half of all federal prosecutions nationwide. Then-Secretary of Homeland Security John Kelly then directed Customs and Border Protection (CBP) and other Department of Homeland Security (DHS) agencies to target people for offenses that included “illegal entry and reentry.” In April and May, Attorney General Jeff Sessions instructed federal prosecutors to make “immigration offenses higher priorities,” target “first-time improper entrants,” and “charge and pursue the most serious, readily provable offense” in all charging decisions. These directives subvert U.S. treaty obligations that prohibit the penalization of refugees for unauthorized entry or presence—protections created in the wake of World War II after many nations treated refugees seeking asylum in their countries as “illegal” entrants. As a result, asylum seekers are subjected to a deeply dehumanizing system that punishes them for seeking protection and threatens to return them to countries where they will face persecution—a violation of the Refugee Convention. A Mexican woman who crossed the border in search of protection and immediately sought assistance from border agents, was referred for criminal prosecution by CBP, convicted of illegal entry in November 2017 in Tucson, Arizona, and then deported back to Mexico despite her request to be interviewed by a U.S. asylum officer. A Honduran woman who fled death threats called U.S. authorities after she safely crossed the border but was referred for criminal prosecution and convicted of illegal entry in a group hearing in December 2017 even though she told U.S. border officers she wanted to seek asylum. Border patrol officers referred a mother and father fleeing government threats in Venezuela for criminal prosecution for illegal entry and separated them from their fifteen-year-old daughter, who was sent into federal foster custody. An asylum seeker severely persecuted in Mexico due to his sexual orientation was referred for criminal prosecution by CBP; during criminal proceedings, DOJ told his lawyers it would increase the recommended criminal sentence if he refused to waive his right to seek asylum. From April 2017 to January 2018, Human Rights First conducted in-depth research on the prosecution of asylum seekers and migrants for illegal entry and reentry. We visited eight federal courts, including two in Arizona (Yuma and Tucson), one in New Mexico (Las Cruces), and five in Texas (El Paso, Del Rio, Laredo, McAllen, and Brownsville.) 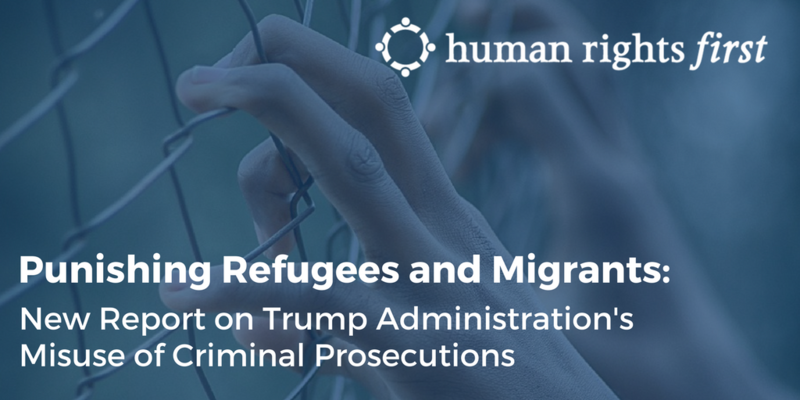 We observed more than 700 prosecutions of migrants charged with illegal entry or illegal reentry. We also met with numerous stakeholders: federal district court and magistrate judges, assistant and special assistant U.S. attorneys, criminal defense attorneys—including federal public defenders, Criminal Justice Act (CJA) panel attorneys, private and nonprofit immigration attorneys—investigators, current and former border patrol agents and representatives, and community activists and organizers.